Hersheypark® is a beautiful family playground all year round, but we love how it twinkles with 4 million Christmas lights in November & December for Hersheypark® Christmas Candylane®! Throughout the park, you’ll find hundreds of holiday decorations, more than 50 family rides and coasters, your favorite Hershey’s Characters in scarves and hats, and even Santa and his nine live reindeer. Overlook the festive sights from the Hershey Triple TowerTM and the Kissing Tower® or catch a glimpse as you whiz by on the SidewinderSM or sooperdooperLooper®! Be sure to grab a cup of hot cocoa as a warm treat. 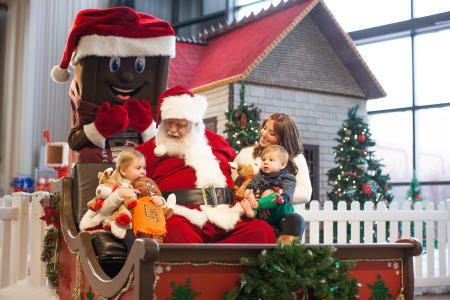 Santa Claus loves to spend time in Hershey - he has a sweet tooth, you know! Make a reservation with Santa, Mrs. Claus, and their friends for a special breakfast or lunch at Hersheypark PlaceSM restaurant, where children 12 and younger will hear stories, sing songs and receive a special holiday treat! Hershey locals know it’s almost Christmas when crews set up the Hershey Sweet Lights®. We lost count of how many twinkling lightbulbs make up this holiday drive-thru spectacular! There’s more than 600 massive, illuminated and animated displays like Santa and Rudolph riding a coaster, the toy factory at the North Pole, the 12 days of Christmas, a Victorian village, and more! Hershey Sweet Lights brightens up two miles of wooded trails making this winter wonderland one you can enjoy from the comfort of the car! For a fully festive experience, climb aboard the old-fashioned Sweet Lights Trolley where the trolley conductors provide chocolate, caroling, and creative commentary! Whether it’s a stop before or after Hersheypark or a special trip while you’re in town seeing the family, Hershey’s Chocolate World Attraction is bustling with sweet holiday fun! Take the free Chocolate Tour where you’ll learn about how The Hershey Company makes their delectable delights and shop for stocking stuffers and gifts for everyone on your list. Santa Claus makes a special seasonal appearance to jot down your Christmas wish list. He usually finds a place to sit in front of the annual Hershey’s Holiday Chocolate House, standing 9 feet tall and decorated entirely with Hershey’s chocolate and confections! No nibbling the chocolate bar shingles, please! Start the day off jolly by sharing chocolate chip pancakes with Santa, who clearly loves a good breakfast with all the trimmings! At Breakfast with Santa, enjoy a warm morning meal, a portrait with Santa, children’s gifts, a cookie decorating station, holiday crafts, appearances by the Hershey’s Characters, and 4D Chocolate Mystery Show. If you can’t get the kids up and moving for breakfast, Santa is available for photos select days and times mid-November through Christmas Eve. Stay warm in between your holiday activities with a mug of Hershey&apos;s hot chocolate, and if the flakes fly in December, Chocolate World&apos;s attractions are all indoors! We&apos;ve heard that Santa shops in Hershey to find the best deals for his enormous list! While you’re in town for the festive attractions, the Tanger Outlets Hershey is your one-stop holiday shopping destination. Shop clothing, shoes, handbags, candles, toys, gadgets and dozens of name-brand shops for the guys and gals on your gift list. New for Christmas this year: American Girl Outlet, Michael Kors, Vera Bradley, and a drive-thru Starbucks to keep you moving! Is there a kid who has everything on your list? Find something unique and unusual at Toys on the Square, a little shop in the heart of Hummelstown that specializes in screen-free fun. An exciting holiday outing in Hershey wouldn&apos;t be complete without a chalice of Mad Elf at Tröegs Independent Brewing. This once-a-year creation is bursting with the Christmas flavor of ripened cherries, raw honey and cocoa, plus notes of cinnamon, clove, and allspice. If you tried Mad Elf before, Mad Elf Grand Cru is the “director’s cut” with more cherry cheer! Also on tap is Blizzard of Hops Winter IPA, the last brew in their hop cycle that’s described as a storm of hoppy citrus and pine notes! Hershey and the surrounding area is home to few wineries who are eager to pour you a glass of cheer. As you might imagine, we love to combine chocolate and wine in Hershey The Sweetest Place on Earth®. Savor their famous Coco Nostra chocolate wine at Cullari Vineyards and Winery or the Chocolate Port from Cassel Vineyards. A holiday dinner at The Hotel HersheySM or Hershey LodgeSM should start with a Hershey’s Kisses Signature Chocolate Martini made with vanilla vodka, chocolate vodka and crème de cacao. For those that love the combination of sweet and salty, the Reese&apos;s Peanut Butter Cup Martini, which blends peanut butter rum, chocolate vodka, and chocolat liqueur. 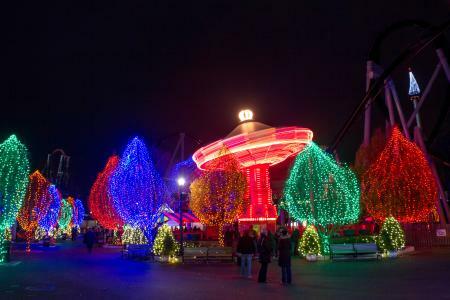 Nowhere else in the region captures the magic of the season quite like Hershey! Whether you&apos;ve come here for a getaway or you need things to do while you&apos;re visiting the family, we wish you good tidings this holiday season!